When it comes to direct cremations in San Diego, CA, there are not many places you can go, as usually this means your loved one is to be moved directly from the place of death to the cremation building. Direct Cremation means your loved one is cremated in our onsite crematorium, and their cremated remains are returned to you without a ceremony or service. There are exceptional benefits in choosing Cortez Cremations and Funeral Services. We have an on-site Crematorium. We have the only independently owned and operated onsite crematorium in the south county. Once your loved one is taken into our care THEY WILL NEVER LEAVE OUR CARE UNTIL THE FINAL DISPOSITION TAKES PLACE. Low Cost. Since we are family owned we do not have high overhead. We are able to pass the savings on to our families. Witness Cremation. Since our crematorium is onsite, there is no need to travel great distances to witness the cremation process. No other independent cremation provider in San Diego can make these promises. Allow us to guide you through this difficult time. Give us a call today. 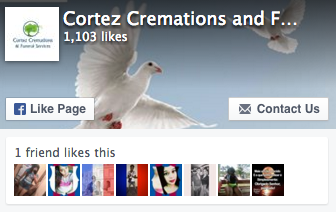 "I highly recommend Cortez Cremations should a friend or acquaintance be in need of service. It was my first time looking for a cremation service and had many questions regarding the process. Angela the owner is experienced and caring; made a difficult process much easier since she handled everything from beginning to end. Look no further!" View our General Price List for additional information.